When you’re undergoing orthodontics, you’ll want to keep up with your dental hygiene. There are three main pillars when it comes to your dental hygiene: your daily maintenance, your diet, and professional care. As your affordable orthodontist and pediatric dentist in Arlington, VA, we at Arlington Pediatric Dentistry would like to explain how to fulfill each three and attain an optimal level of dental hygiene during orthodontic treatment. While you’re probably aware of how important brushing and flossing is for achieving your best smile possible, you may not know that it’s even more important to do so when you’re wearing braces. 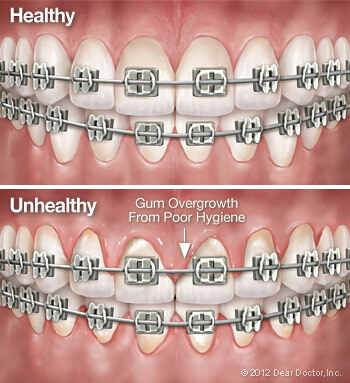 The reason for this is because braces are filled with nooks and crannies where food particles can get trapped. Your braces will likely make the simple tasks of brushing and flossing more complex, which is why we’d like to give you a few tips for daily maintenance. For proper brushing, we recommend using either a soft-bristle or a bi-level toothbrush (one with longer bristles on the edges and shorter ones in the middle). This can be effective even when you’re wearing braces. If you prefer, an electric toothbrush can be used, as long as it’s on a moderate setting. If you’re having trouble with your daily flossing, there are several products available that can help you with this task. Floss threaders and a few particular kinds of floss can help you get the floss between your wires and your gum line more easily. If you’re wearing a retainer, you should brush it daily in the same way that you brush your teeth. We may suggest using a cleaning solution for your retainer. Also, remember to never put hot water on your retainer as it can distort the retainer’s plastic. The first thing you’ll want to do when it comes to your diet is eliminate foods that are very hard or sticky. These types of foods can cause damage to your braces. Hard foods can potentially break your wires and brackets while sticky foods can get stuck in your braces and sometimes pull them loose. Next, you’ll want to avoid foods that are high in sugar as sugary foods can increase your chances of developing tooth decay. Unlike hard and sticky foods though, you won’t need to completely cut out sugary foods from your diet; just make sure to use moderation and don’t consume too much sugar. A common misconception that many people have is that a patient with braces doesn’t have to go see the dentist. After all, since he or she will be regularly seeing the orthodontist, that person is already getting professional dental help. The truth, however, is that visiting a dentist at this point is just as important as ever. While we’re able to improve the bite and alignment of a patient’s teeth, dentists will be able to make sure that teeth stay healthy by providing cleanings, examinations, and preventive care. Orthodontic treatment is a team effort where everyone plays an important role – us, you, and even your dentist – in helping you achieve your best smile. Visit Your Arlington, VA Affordable Dentist and Pediatric Orthodontist! As your affordable dentist and children’s orthodontist, we’re glad to offer our in-house discount plan to get you a more affordable and accessible treatment. To schedule with us, please feel free to give us a call at (703) 671-KIDS or fill out our online appointment request form. We’re looking forward to seeing you!